SAN ANTONIO (AP) The situation looked all too familiar for the beleaguered Spurs. San Antonio blew another double-digit lead in the final minutes. This time, the Spurs did just enough to win. 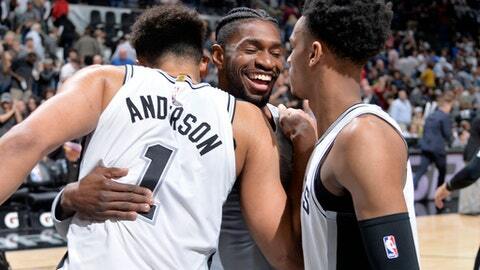 LaMarcus Aldridge scored 25 points, Dejounte Murray had 18 points and 12 rebounds, and San Antonio overcame another late rally to beat the New Orleans Pelicans 98-93 on Thursday night. ”For us, the motivation is that we still want to try to do everything we possibly can to try to accomplish the goal that he set out for us. That’s to try to put ourselves in a position to win a championship,” Pelicans coach Alvin Gentry said. Anthony Davis finished with 21 points and 14 rebounds but fouled out after playing 36 minutes. New Orleans dropped into sixth in the West. San Antonio moved into eighth in the West, holding the final playoff berth after sitting in 10th earlier this week. The Spurs had dropped out of playoff position in part after blowing a 17-point lead to the Los Angeles Lakers and a 15-point advantage against New Orleans. New Orleans again erased a 15-point deficit to pull within 91-90, but Davis fouled out soon after. Jrue Holiday added 24 points for New Orleans. Davis got into foul trouble midway through the third quarter on a pair of fouls against Ginobili that left the 6-foot-10 forward and his coach irate. Davis was first whistled for a charge with Ginobili standing at the top of the key, resulting in a technical against Gentry. Minutes later Ginobili slowed while dribbling upcourt, causing Davis to crash into him for a foul that would lead to technical against Davis. ”When A.D. fouled out, or when they called a sixth foul on A.D., obviously that takes our best player off the floor,” Gentry said, clearly still flabbergasted with the calls. Trailing 96-93, Nikola Mirotic’s 3-pointer from the left corner hit the side of the backboard with 9.3 seconds remaining. Pelicans: New Orleans won the first two games of the season series. The teams will play again April 11 in the season finale for both clubs. … The Pelicans’ bench was held to 25 points, including 16 from Ian Clark. Spurs: Aldridge now has 1,379 points this season, his most in a single season since joining the Spurs. … Danny Green went back to the locker room in the third quarter and returned with a bandage under his right eye after a collision on the court. … Murray remained on the court for a couple of minutes after rolling his ankle on Green’s shoe while awaiting a rebound. Murray had 12 rebounds, which is two shy of the career high he has had twice this season. The lanky 6-foot-5 point guard is averaging 5.5 rebounds, which only trails the team’s starting frontcourt of Aldridge, Pau Gasol and Kyle Anderson. The Spurs observed a moment of silence for Benson, who passed away Thursday afternoon. Pelicans: Host Houston on Saturday night. Spurs: Host Minnesota on Saturday night.